This is the season that causes people to feel a pull toward joy. A joy that for some is contrived and painful. There, in this season of supposed joy, is a deep grief that loss brings. A loss of a person you love or hate, an animal that was dear to you, a job, etc. It could also be the loss of a relationship that was deemed important at one point. Now looking back with fondness on the better days you sorely miss it. The songs in the stores and on the radio. The decorations on the streets, on the houses, & seemingly everywhere. They are a constant reminder of what you have lost and the pain you are feeling. It is strange that in the most wonderful season of all walking around hearing that it is the hap-happiest time of the year and many are not really “feeling” it. But that makes it so trite. Not “feeling” it? No, they are grieving and life has taken a turn in a direction they did not expect. The hard thing is that this feeling is hidden as far down as the person who is experiencing it wants it to be hidden. No one ever has to know about the pain if the griever doesn’t want anyone to know. Joy is an easy thing to fake. Show up to a party, laugh, engage in lively banter, meet new people, eat and drink too much. No-one needs to know that the pain you feel this to me of year is real and harmful to you and the people around you. It is interesting that people in grief are expected to cover their pain so that others can “enjoy” the season and not have to worry about the “downers”. I feel like this months conversation about slavery is like this grief joy dichotomy. Isn’t it something that December is the month that was chosen to raise awareness to this cause? The month where we buy mounds of stuff for people who may already have loads of stuff. The month where we have parties celebrating different holiday times. The month where we cherish time spent with family and friends. The month where we pull our hair out in stress due to financial issues or lack of ability to please others. It is the month that was chosen to shed light on the people who are bought and sold on a daily basis. It is a month where every morning I put on a dress and think about why I am wearing a dress. We don’t want to see the slavery. We want to have the whole world at peace and in happiness for this one month during the year. But that is the dichotomy. That is what makes this month sometimes a farce. It is why this HAD to be the month to raise awareness for this cause. Slavery is a hidden ill in society. It is something that is hidden so deep that we don’t have to see it if we don’t want to. We can easily go on enjoying our parties and fun this month. It’s like the sadness that is so pervasive this holiday; “a downer”. If we don’t face it now it’s not like it is going away. We need to look at it and take a stand, do something, help others that are outside our safe zone. We have to look at it square in the face. IJM helps us do that. They tell us that they have freed and helped in after care 18,000 people. They have convicted 770+ people who were slave owners. They are making a difference and shining a light on the problem even in this month. You can help too. Look at what IJM is doing and see what you can do with them. 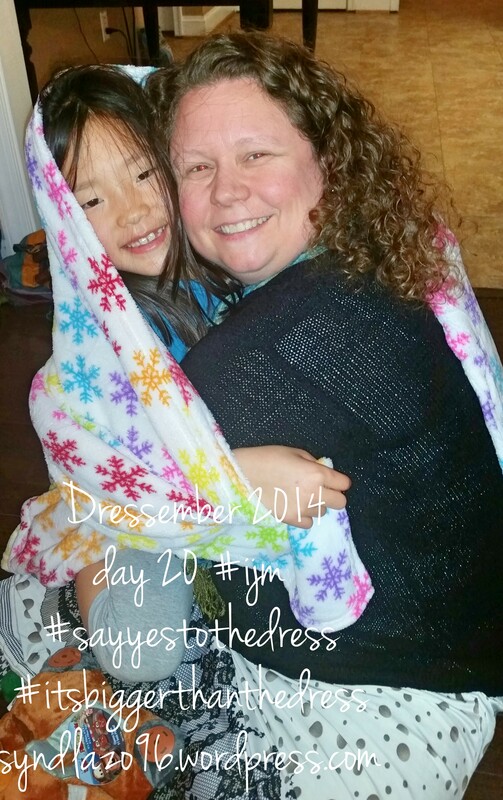 You can donate to my Dressember site where all the proceeds are going to help IJM and their mission. You can also pray for those enslaved, their owners, and the people who are working to free them. Yes, I said pray for their owners. We can talk about that next time. This sweet little face is that of the daughter of one of mah honks. I love this girl to the moon and back!